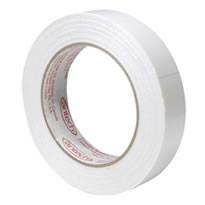 Clear double-sided semi-permanent polyester tape coated with a high-temperature performance acrylic adhesive. (Will resist 300 degrees Fahrenheit/150 degrees Celsius for 30 seconds. Use for leather, absting, etc. Temperature: 10 to 225 degrees Fahrenheit/-12 to 107 degrees Celsius.